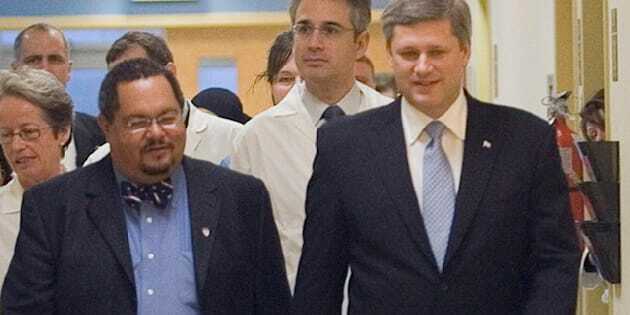 OTTAWA - Arthur Porter was a donor to the federal Conservatives during his time at Canada's spy watchdog, public records show. But his contributions appear to have run afoul of guidelines that all members of the Security Intelligence Review Committee must abide by. Elections Canada records show Porter gave the Tories the maximum donation allowed by law over a period spanning the weeks leading up to his appointment to SIRC through to his rise as chair. The former head of SIRC now faces allegations of fraud in one of the country's most expensive infrastructure projects. The Canadian government is trying to extradite Porter from the Bahamas, where he runs a medical clinic and is apparently cancer-stricken. He has said he is too ill to travel, and he denies the allegations against him. Until recently, Porter — a medical doctor and cancer specialist — was a reliable Conservative donor. Porter made two donations totalling $1,100 less than three weeks before Prime Minister Stephen Harper appointed him to SIRC in September 2008. In 2009, he made two more donations for a combined $1,100. Harper appointed Porter chair of SIRC in June 2010. That October, he once again donated as much the law let him. Porter resigned from SIRC in November 2011. Elections Canada records show he has not given money to any political party since 2010. Conservative party spokesman Fred DeLorey declined to speak about Porter's donations. "We have no comment," he said in an email. SIRC executive director Michael Doucet told The Canadian Press all committee members are briefed by the Privy Council Office on, among other things, the rules that apply to them when it comes to political activities. Those rules advise against making donations, joining a party or running as a candidate in an election. "The members and the chair come to us having been briefed, and having the PCO doing their thing with them as privy councillors," Doucet said. It appears Porter did not follow those guidelines. "Potentially," Doucet said. "We'd really have to talk to the PCO, because that is their bailiwick." Porter's days as a Tory donor stretch back nearly a decade. Elections Canada records show Porter gave the Conservative party $1,000 in September 2004. In January 2006 — three days before Harper's Conservatives came to power — Porter donated another $1,000 to the party. In October 2006 — before donations were capped at $1,100 — he made a $1,275 donation to the Conservative riding association of Laurier-Sainte-Marie in Montreal. Former Bloc Quebecois leader Gilles Duceppe held that seat from 1990 until being toppled by the NDP's Helene Laverdiere in the last federal election. It appears likely the October 2006 donation was part of a fundraiser or event. Nearly 400 people donated to the Conservative riding association of Laurier-Sainte-Marie on the same day as Porter, Elections Canada records show. Porter did not immediately return a message left with a receptionist at his clinic in the Bahamas. No one else in recent years appears to have given money to a political party while heading up SIRC. Porter's predecessor, Gary Filmon, made no donations to political parties or local riding associations during his 2005 to 2010 term as SIRC chair, according the Elections Canada records. Nor did another former SIRC chair, Paule Gauthier. Her term as chair ran from 1996 until 2005. Gauthier told The Canadian Press she does not recall SIRC having any rules about political donations. Former Conservative cabinet minister Carol Skelton was appointed to SIRC in 2010 and took over as temporary chair after Porter resigned. She did not make any political donations during her time as interim chair. Porter is among the five people named in arrest warrants issued by Quebec's anti-corruption squad, in the case of the $1.3-billion construction of a Montreal mega-hospital. The others are: former SNC Lavalin senior executives Pierre Duhaime and Riadh Ben Aissa, Yanai Elbaz and Jeremy Morris, the administrator of a Bahamas-based investment company. The warrants say the men are wanted on numerous charges — including fraud, breach of trust and document forgery. They say Porter and Elbaz are suspected of having accepted bribes from some of the others. In addition to being head of SIRC, Porter was also the director general of the McGill University Hospital Centre when the alleged fraud occurred.